BUSHWHACKING MADNESS: Many of the trails in the Southern Los Padres are in poor condition due to a combination of lack of consistent maintenance and not many people traveling the trails. If you spend any significant time exploring the backcountry, you will eventually be confronted with a difficult to follow trail. Below are a few tips and tactics for getting you through the trail, back home safely and hopefully keeping you happy while bushwhacking. 1. RESEARCH – Check online for the most recent trail and forest conditions (HikeLosPadres.com, SantaBarbaraHikes.com, Facebook.com), contact the Forest Service and research research research (Craig Carey’s book is great as are a bunch of bloggers out there, Google search). 2. MAPS – Go online and take a screenshot of the USGS 1:24,000 topo quads (nationalmap.gov) of the area you will be going. Print it on a letter size sheet of paper to bring with you. Check as many map sources as you can and compare them to each other in order to find the best and most reliable source. 3. TAKE A TOUR – Take a few minutes and explore the area you will be hiking on Google Earth (earth.google.com). Zoom in, pan around and familiarize yourself with where you are heading, what direction the creeks flow, nearby prominent landmarks and visually follow your hiking route to look for potential trouble spots. Add a tablespoon of salt and repeat steps 1-3 as needed. 4. WEATHER – Check the weather (weather.com, noaa.gov) ahead of time and be prepared for whatever Mother Nature might throw your way. 5. TECHNOPHOBE – This is a hard one for me to write but utilize technology as much or as little as you might need to feel comfortable and confident in the backcountry. The amount of backpacking apps, programs, devices and digital tools continues to grow; daily. Don’t be afraid. If you need it, there is no harm in using them. If you don’t, that’s cool, stay away. The devices are just another tool to help get the job done. Personally I use a Delorme GPS religiously and it’s helped pull me through some of the nastiest bushwhacking the forest has to offer. Some of the trail junctions, camps and trailheads have metal boxes with a trail sign-in book inside. 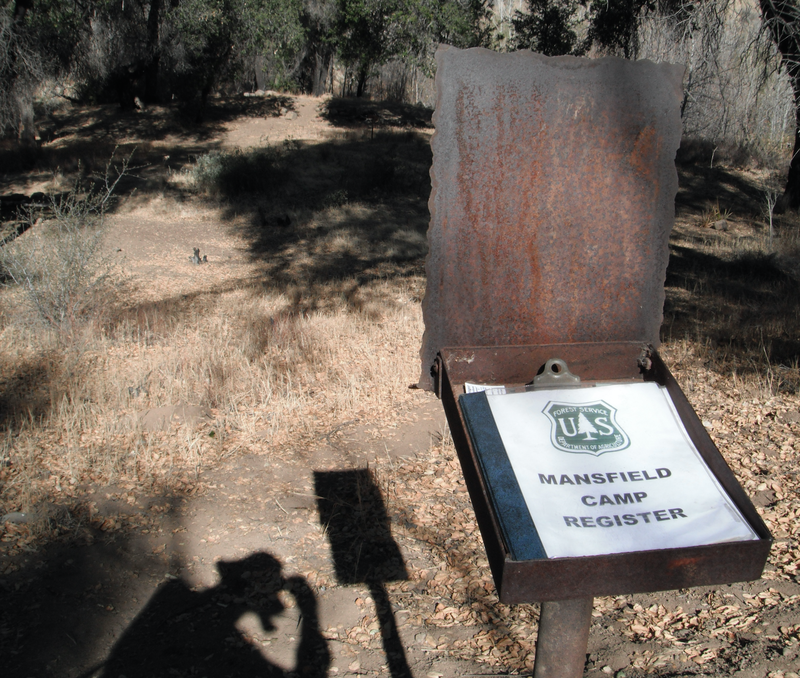 These are called registers, are mostly in Santa Barbara County and usually have a few pens and pencils inside so that hikers can note where they’ve been, where they plan on going, trail conditions and anything of interest they might have seen. Some calculations indicate that less than 10% of hikers actually sign it at the registers. It’s actually very important to sign in at the registers. By signing in you are providing invaluable information for any hikers that come behind you. You are also putting a place and time on your status should you happen to need assistance. In addition the registers provide the Forest Service with information to help them determine which trails to allocate resources to. Some people elect to not sign in so that they might stay anonymous while on the trails. If this is your stance then sign in under a trail name or an alias, but please sign in – it’s a good thing that helps everyone and hurts no one. – Pay attention to your surroundings. Know where you are on the map. Keep track of any substantial creek confluences, trail junctions or camps you pass along the trail. If the going gets tough and you start to feel lost, it’s crucial to know more or less exactly where you are on the map. – If you start to feel lost, STOP HIKING, DON’T PANIC and figure out where you are. Study your maps and cross-reference them to local geographic features. Then attempt to get back to where you know the trail is. This sometimes means going backwards, which is always better than moving forward in the wrong direction. – Most of the trails were built to a standard of 5-8 foot wide trail corridor. Depending on vegetation, the trail builders most likely used saws in order to cut a path through the forest. The old saw cuts on the trees are called “cuts” and if found can provide a breadcrumb for finding your way through the forest. When looking for old cuts, look deep into the brush as newer growth can cover the old cuts and look for unnaturally straight angles on branches. Even if you see a cut every 15 minutes or so, that can lead you safely to your destination. – Another trail object to look for are cairns or ducks. These are strategic piles of rocks placed in order to keep people on the trail. They are normally built in places such as meadows or creek crossings where vegetation, or lack of, makes the trail hard to decipher. – Sometimes trail builders will scar, carve or mark a tree with an engraving in order to let people know they are on the trail. These markings on trees are called “blazes”. There are not too many trails that have blazes in the Southern Los Padres, but it’s important to look for indications of blazes in case your trail has them. They can be found above eye level in older trees. – The most commonly used trail marking method is taking bright colored rolls of plastic tape and tying a portion of it to trees or bushes in order to indicate where the trail is. This is called trail “flagging”. Flags are normally 6-12” long and are tied at head level so as to be easily seen by hikers. Most flags will last between 1 to 3 years depending on what their exposure to the elements is. Flagging is somewhat controversial as some people consider flagging a form of littering. Yet when faced with bushwhacking, a discovered flag can feel like a kiss from an angel. – Another tried and true method for reading the trail is to look for signs that other hikers have been on the trail. Most obviously would be footprints. Unfortunately another thing to look for is trash, most commonly candy wrappers, water bottles and old rusted cans. – Sometimes it might appear you are following a hiking trail but instead you might be on a game trail (deer or bear are the most obvious) or perhaps even a rogue human trail (pot growers or peak baggers). Use common sense and if the trail starts to head up a super steep bank or zag in ways that normal trails don’t, then turn around and head back. Similarly if you notice excessive amounts of trash, plastic irrigation tubing or anything indicating pot growing, turn around and get out of there. This can’t be the trail….!?! – Try not to hike alone. Solo hiking has its perks but it’s always safer to be with someone else. Find your hiking buddy and bring them along. This is the most important safety blanket should something happen to you along the trail. – It’s hard to be rescued if no one knows where you are. Leave an itinerary with some friends or family that lets them know where you plan on going and when you plan on getting back. If you are not back in time, then they will have a good idea of where to start looking. – Cell phones tend to work at most of the peaks and higher mountain ridges. Pack your cell phone, even if you don’t plan on using it. It’s another great lifeline should you need help. – Over the past decade there have been a growing number of hikers who use the SPOT satellite messenger to relay information to friends and family at home. Basically SPOT is a small GPS satellite device that can remotely send a variety of customized notices to people on an email list. SPOT is a very cool technology for backpacking and can save your life if things go badly, not to mention it’s a great way to check in with loved ones at home. – Don’t panic. Most people are not truly lost until they make a poor decision. Most of these poor decisions are panic driven. The best way to avoid getting lost is to not make bad decisions. – If you can’t find the trail and you are getting scared or worried; sit down, take a deep breath and calmly figure out your next move. Get some food, take a rest, laugh at yourself, enjoy the scenery and your mood and anxiety will quickly change. – If you’re exhausted or it’s getting dark then it’s probably best to setup camp right where you are. – Some rest and food will help with decision-making and allow you to best ascertain what your next move will be. – Try to backtrack to where you last knew the trail was. – Stay safe. Remember that wherever you go, you may have to backtrack, so avoid risky situations like climbing steep hills or dropping down gullies. – If all else fails, and someone knows where you are, it might be best to sit tight and wait for help to arrive. While it may hurt your ego and wallet to get airlifted to safety, it’s far better than not making it back at all. Emergencies and people getting lost in the backcountry is a rare occurrence, but it does happen. Even with the tips mentioned above, accidents can happen and you can get lost. Following these few rules can certainly help lessen the risk of getting lost as well as increase your chances of having fun while bushwhacking some of the harder routes of the Southern Los Padres. But nothing serves you better than a little common sense while on the trail.